In the production of our products we use belts, buckles and webbing. The side release buckle above is a high quality YKK two (2) inch buckle. This is the same buckle we use as an option for the belts on our aprons. The two inch webbing is heavy duty polypropylene. The stock colors we carry are displayed in the top picture in the following order are: TURQUOISE, BLACK, BLUE, GOLD, RED, GREEN, PURPLE & SILVER. 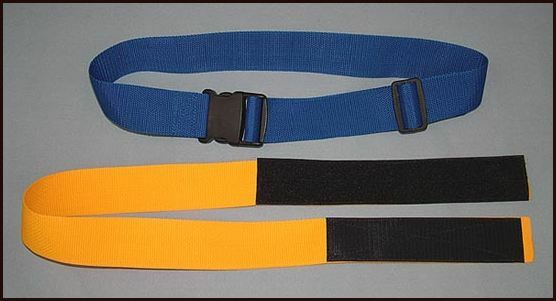 The belts are adjustable and the stock belts have a range from about 10-48 inches. These belts have thousands of uses from going around your luggage for added security to going over your outside garment to hold tighter for added warmth. We also use hook & loop which is commonly referred to as "Velcro". We offer this as a belt option on our aprons also. This type of belt is INCREDIBLY useful for securing items with ease! You just place it around, pull tight and place together. The holding power of this two (2") hook & loop strap is impressive!!! 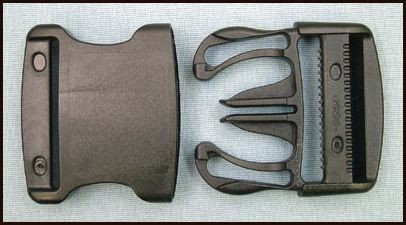 Typically we use an 8 inch piece of "hook" (stubby/coarse side) and a 12 inch piece of "loop" (softer side) on the belts. This gives you some adjustablity being the you only need to overlap a few inches for substansial holding power. We can easily add more loop which increases the range of adjustabilty. 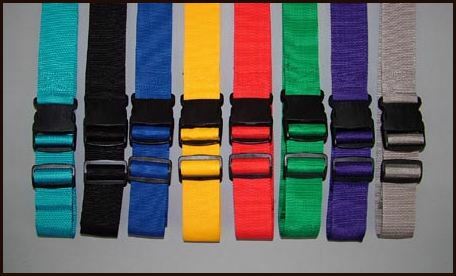 WE can make these straps/belts any desired length. The size range of adjustment is all realitive to the total length of belt and amount of hook & loop. This H&L Belt comes in sizes regular-XXXlong and custom sizes if needed. Price increases $0.25 per size. Please inquire about volume/quantity pricing. Any of these belts can be made in any size and will be priced according to total length.